What is it? And why would you want it? EMAS is an acronym for Environmental Management Audit System. Sounds a bit daunting? Let us explain what it is. This website gives you all the tips to start introducing small steps. EMAS is a more consolidated approach when you feel you need a system to implement the bigger changes. 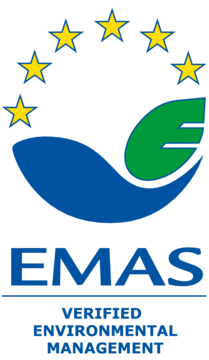 EMAS is a certification from the European Union which proves that you are making efforts in field of sustainability and nature preservation. In a nutshell, it requires you to check how your company impacts the environment, decide on what you want to improve in the near future, check how you are doing and publish a statement about your company’s green performance. EMAS is a joint project between you and your employees (and hopefully with some participation from your guests). It is a new management approach which is inclusive and has proved to be transformative for thousands of businesses in Europe. It is the similar to the ISO 14001 certification which is known at the international level, and both EMAS and ISO are the leading certifications and process in the world on sustainability. What do you gain by introducing EMAS? You continuously transform your business by introducing regularly new small efforts to change and improve. EMAS provides the mindset and the steps to do just that. You will save money by lowering energy and water consumption, reducing waste and purchasing costs. Your business will become more profitable. Some of the changes involve more investment at the beginning but they will pay off in the long run, and you choose which one are fitted to your time and budget. By adopting a coherent approach towards transformation you do not stagnate; you challenge the status quo in your business. You are continually preparing to reduce risks that can arise in the future. You also have start to gather pieces of a marketing strategy which is founded on sustainability. It means that you can take an advantage over your competitors by marketing your greening efforts with a certification which is recognised. You have more time and less stress – you simply follow the plan you have adopted. You are no longer lost in a multitude of ideas, you follow a clear path. Managing is more straightforward when you are not trying to reinvent the wheel all the time – and EMAS thousands of registered companies have paved the way for a great process. You have a well-renowned certification which shows you are a serious player. You can improve your image and attire both good employees and new guests who are looking for consuming greener. Feel like EMAS could be useful for your business? The next step is to visit EMAS website and get to know the whole framework. If you are not sure you want to jump already, the website you are currently navigating is full of practical actionable steps, and we invite you to read the articles.